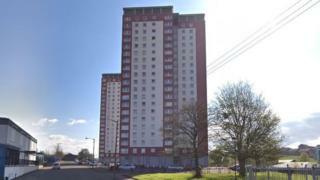 The death of a woman who fell 11 floors from a block of flats in the north of Glasgow is being treated as suspicious. Police were called to Charles Street in Royston at about 17:15 on Monday with reports the 30-year-old had fallen. She was taken to the Glasgow Royal Infirmary where she was pronounced dead. A post mortem examination will be carried out however police confirmed the circumstances were suspicious. Officers are checking for relevant CCTV and will carry out door-to-door inquiries. Anyone who witnessed the incident has been asked to contact the police non-emergency line. Det Insp Aileen Boyle from the major investigation team said: "A young woman has lost her life and it's imperative we find out what happened. "This is a highly populated area and I'm sure people will have witnessed the incident. I am appealing to them to contact us as we need as much information as possible so that we can piece together what has occurred. "Local residents in the area will be shocked by this incident and I would like to reassure them that we will do all in our power to find out how this young woman died."